We are a Public-Purpose registered charity with the IRS as a 501 (c) 3 organization in its seventh consecutive year of service to the community based in north San Diego County. Our mission is to rescue, rehabilitate and re-home at risk small dogs from high-kill municipal animal shelters across southern California. We are a 100% volunteer organization and pay no salaries with a network of foster families ready to receive, de-stress and prepare these rescued small dogs for adoption. 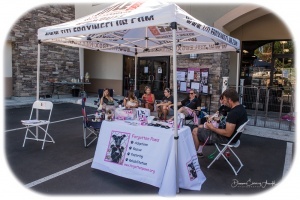 We are also a Petco Partner and hold adoption events each weekend at several north San Diego County store locations. We are active in social media and have a professionally managed website maintained by our volunteers. We re-home approximately 200 small dogs each year and provide end of life hospice care to dozens more. Our adoption donation request averages $250 which includes Vet exam, spay/neuter, 5 way shots plus Bordetella, Rabies shot with Certificate, microchip with life long registration, collar with identity tag, harness & leash and high quality organic grain free dry food for transition to the new home. We carry General Liability insurance on our operations, volunteers and event location providers. Our history with the successful re-home of over 1,300 small dogs to date has demonstrated the critical need to provide high quality Veterinary medical/dental care to prepare these adoptable small dogs for their forever families. This expenditure represents up to 70% of our operating cost each year. 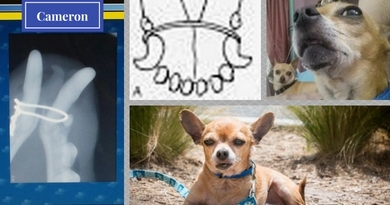 We have discovered that municipal shelters often fail to detect critical medical issues affecting these small dogs offered for adoption, routinely make mistakes on paper work and even if seen by their staff may still require medical attention. Our mission & heart requires we rehabilitate these deserving dogs as needed so not to pass on this initial burden and expense to the adopting families. Sadly, despite all our volunteers best effort and ‘due diligence’ work when visiting municipal shelters in southern California; up to a third of reported healthy ready to adopt small dogs require some form of Veterinary medical/dental attention. Our rescue partners include high quality full service Veterinary Hospitals that provide significant discounts to us as a 501 (c) 3 charity for professional services, medications and critical care boarding. Beyond simple spay/neuter, microchip and dental work we discover and need to address hernia repairs, oral issues, broken bones, skin diseases, blood, heart, liver & renal disorders, and from time to time cancer. 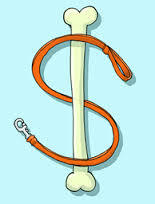 We work with our Veterinary physicians to chart the most medically effective course of treatment with cost in mind. When necessary or inevitable we sadly must euthanize as the most humane course of treatment. In our IRS year end filing for 2015, we reported $63, 072 in Veterinary expenses, approximately 75% of our income for the year. 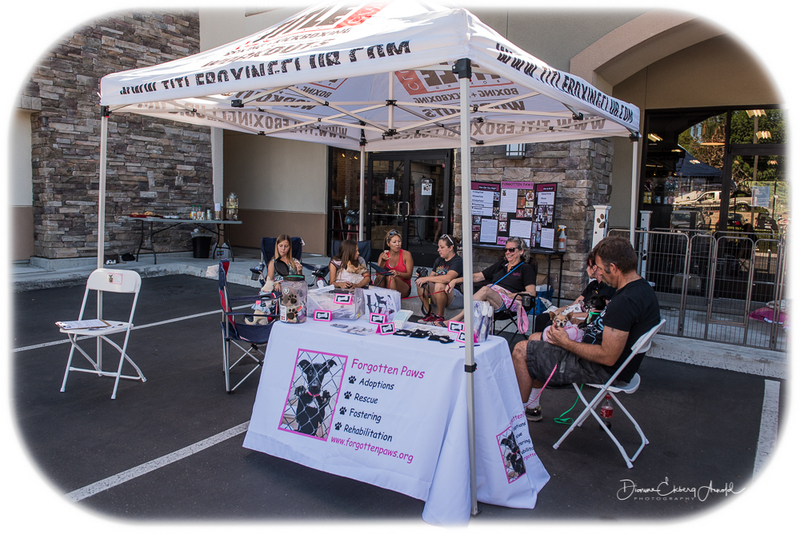 Adoption events held each weekend are staffed by volunteers from our foster families and with the community at large. We provide middle and high school youth with documented hours for community service at these events. Youth volunteers and their accompanying parents are informed about safe dog handling and greeting practices with the public, provide up to date information to share with interested adopters on the dog’s history and known background if available. Plus provide our visitors with reasons why it’s important to adopt not shop for pets, explain the ugly practice of puppy mills and share the joy and enthusiasm our happy dogs bring to adopting families. Once a year the local San Marcos, CA charter school will bring students to volunteer and walk dogs at our events and be informed about the crushing need for spay/neuter and adopt not shop to prevent continued over flow of abandoned, surrendered or stray animal intake at local municipal shelters nationwide. We have received awards from San Marcos as “Best Animal Rescue Organization” for 2015 and again in 2016. 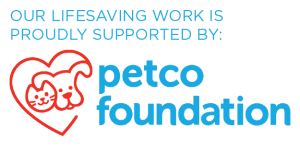 Our rescue has year over year received grant funds from the Petco Foundation, similar national organizations and generous individuals. Short-term, we require quarterly donations up to $25,000 to cover on-going Veterinary expenses. 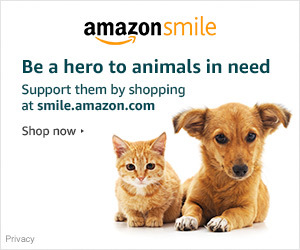 Donations can be made through our rescue or directly to our account with Veterinary hospital partners. Long-term, our goal is to establish a permanent sanctuary in north San Diego County. We envision a multi-acre property with facilities to safely house and foster dogs and cats that can provide visitors with a tranquil and serene environment to visit and interact with adoptable as well as hospice animals alike. Our sanctuary business plan and funding needs are available upon request. The president and founder is a disabled veteran from the Air Force. Her biggest goal for the sanctuary is to be able to board pets of active duty military personnel being deployed overseas. This gives them the opportunity to get their much loved pets returned to them when they come back stateside. In addition, U.S. citizens age 70 1/2 years or older now face annual mandatory withdrawal requirements from their Individual Retirement Accounts. The IRS allows up to $100,000 sent to a qualified charity to count toward satisfying that individuals ‘Required Minimum Distribution’. 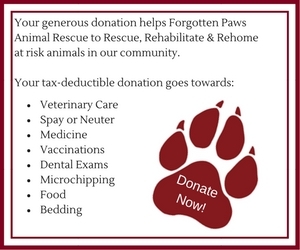 For donations or more information you can call our Treasurer, Bruce Beattie at 949-637-6144, email him at donations@forgottenpaws.org or visit our website which accepts all major credit cards and PayPal.